The new year is here! That means we have a whole year of fun with our families ahead of us! Whether you live in a place where the weather is cold and snowy or not, you can still do these January Activities for kids to make it feel more like winter! If you’ve been following our bucket list activities for kids, our January Activities list is ready to help you kick of the new year with some family fun! We’ve got winter activities for every day of the month but you don’t have to do them in order. There are a few of the January activity ideas that go along with certain days (like Martin Luther King Jr. Day and penguin appreciation day) but most of these January activities for kids can be done in any order you’d like! So pick and choose or go through the entire list! 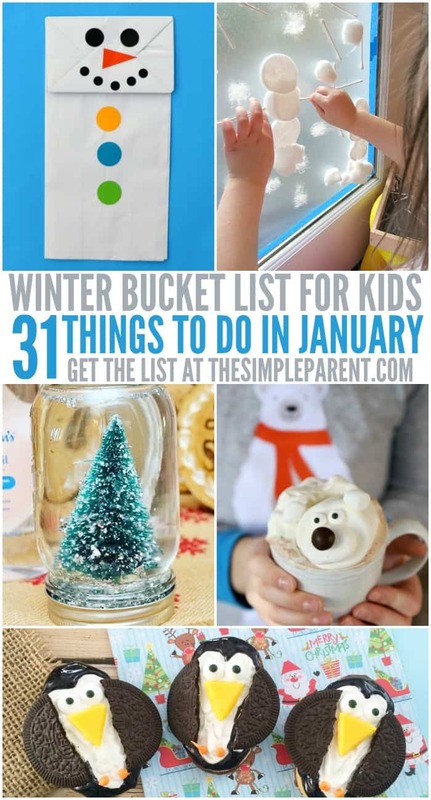 Just have fun doing these January activities with your kids! Whether you have snow or not, you can make a paper plate snowman! Have a snowball fight using snowballs made from crumpled paper! Make your own fake snow if the weather in your area doesn’t give you any! Build a fort and have a warm and cozy family movie or game day. If your kids love animals, these polar bear graham crackers are fun to make together! Then enjoy polar bear hot chocolate together! If it snows where you live, add a few drops of food coloring to a squirt bottle or water gun and then get outside and paint in the snow! If it’s warm enough, get outside! Play catch or take a walk together. Just spend some time together out in nature and get some sun, if you can! Then make this adorable Paper Plate Penguin Craft! Celebrate Martin Luther King Jr. Day with one of these Martin Luther King Day activities! Make your own winter snowglobe! If it happens to snow, make snow ice cream! Design a hat with this easy winter hat craft! Watch (or read) Winnie the Pooh together to celebrate Winnie the Pooh Day! January 19th is National Popcorn Day so pop some up and enjoy a movie with the family! You can also make our Smores Popcorn Bark Recipe together! January 20th is penguin awareness day! Watch a penguin movie and make these easy no-bake penguin cookies together! You can also get out the paint and make Footprint Penguins! Make edible marshmallow polar bears with your kids! The paint a puffy paint polar bear picture! Use things from around the house to make this snowflake craft! Make a paper bag snowman puppet! Learn while having fun this winter! Build igloos with marshmallows and toothpicks! Do a puzzle together to celebrate National Puzzle Day! Celebrate the icicles that many of us deal with in January and grow your own crystal icicles! Once you’ve gotten your fill of winter activities, be sure to check out all of our bucket list activities for kids! We’ll be rounding out the entire year over the next few months! If you’re looking for even more activities to do in January, check out all of our winter activities ideas!